A hero is born from a village that was destroyed by a group of people from other tribes, in a battle where he was born. In peprangan the family and those close to him were massacred. In his heart there was only a smoldering resentment. For years he wandered, just to find people who had ruined her life. 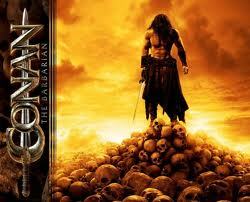 He is Conan (Jason Momoa), the barbarians. Conan's life is far from glorious. He lived from stealing, robbing, and killing. As long as it is also resentment in his heart was never extinguished. He must find the people responsible for the massacre in his village and avenge his father's death. Not unexpectedly, fate brought him to Khalar Zym (Stephen Lang), who all this time he was looking for.